Your destination’s most passionate advocates care deeply about the place where they visit or live. Often, this passion goes beyond a destination’s bucket list experience; the destination’s very identity (as described by its Place DNA™) can become deeply meaningful. Flanders Fields is a place where family heritage and world history converge. The region of Flanders in Belgium is the site of significant World War One (WW1) battles, including the battles of Passchendaele and Messines. More than 600,000 civilians and soldiers were killed in Belgium alone during the war. The conflict and the scars it left behind continue to affect Flanders and its society today. It is a significant element of Flanders’ history and its DNA. Today, many visit Flanders Fields as a symbol for peace and a memorial to all who lost their lives. Visit Flanders makes space for remembrance and respect in Flanders Fields. Understanding that many families with relatives who served in WW1 and individuals deeply interested in the history of this major world event would want to visit Flanders Fields during the anniversary years, Visit Flanders prepared to appropriately greet and support these visitors. Visit Flanders is the destination marketing organization (DMO) that works to develop tourism and visitation to the northern, Flemish area of Belgium that includes Flanders Fields. The team at Visit Flanders knows that people decide to make trips when a destination provides something meaningful to them and they hear positive recommendations (read more about this: the power of interest-based segments to drive word of mouth and visitation). Travellers can be motivated by a fun passion, like cycling or diving, or by a personal and emotional connection. The DMO has a role to play for either motivation; visitor needs and interests will guide the DMO’s actions. Visit Flanders’ existing niches include people who are passionate about beer, Flemish Masters’ fine art or cycling. In addition, the DMO chose to focus on Flanders Fields’ WW1 history for the period (2014-2018) that marks the 100-year anniversary of the war. Visit Flanders respectfully enabled visitors to commemorate the Great War centenary by helping people learn about the history of the war and opportunities to travel in recognition of important dates. 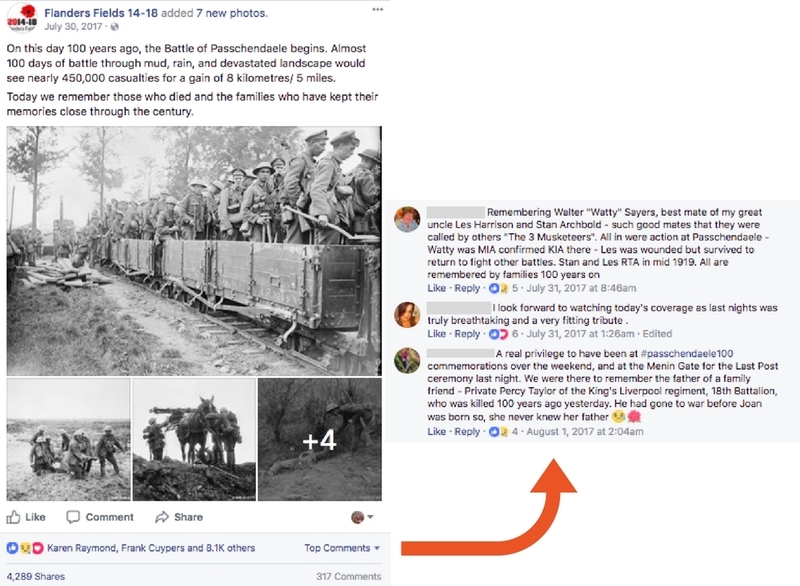 During 2017’s anniversary of the Battle of Passchendaele, past and future visitors shared their histories and stories of remembrance on Visit Flanders’ social media channels, helping the DMO drive word of mouth. In 2017, the niche Facebook audience grew by 36% to 140,000 people who shared individual posts thousands of times, resulting in over two million interactions. Most importantly, Visit Flanders was able to affect many lives by helping people learn about the war and its legacy, explore personal heritage, and by encouraging them to come to Flanders Fields, where that history took place. Challenge: Turning word of mouth into meaningful travel experiences. Goal #1: Respectfully engage with Visit Flanders’ passionate community through social media, especially Facebook. 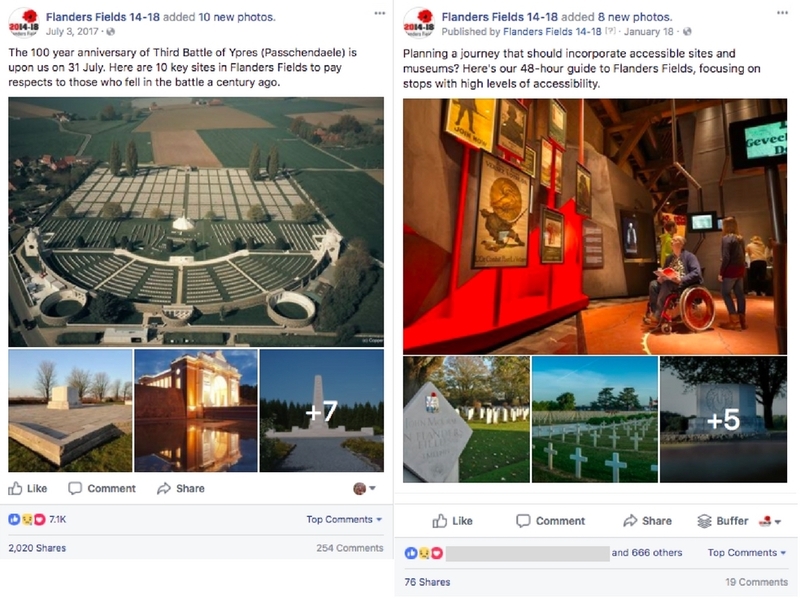 To educate and inspire travellers during the Great War centenary, Visit Flanders established the Flanders Fields 14-18 Facebook, Twitter and Instagram channels to speak directly to its niche audience of people interested in WW1 history. Many audience members hold a deep respect and gratitude for the soldiers, and often have a family member that fought in the war. They understand the significance of Flanders Fields. Visit Flanders matched passion to location by focusing on English-speaking visitors from the United Kingdom, Ireland, Australia, New Zealand, Canada and the United States. Though other nations also fought in Flanders, these countries were chosen for this project because they each have a strong historical bond with Flanders that continues to the present day. They also hold some of Flanders’ largest international travel markets. Their residents visit alongside people from other countries with memorials in Flanders Fields, including Belgium, France and Germany. Goal #2: Find return-on-investment (ROI) from social media. When Destination Think! took over the Visit Flanders channels in January 2017, one of the goals was to shift the channels toward travel inspiration. Until this time, some tourism information was provided, but the channels were predominantly used to engage the niche with historical facts. Visit Flanders wanted to make sure the community came to visit. Solution: High-quality, purposeful content leads to high-quality community engagement. Here’s how the Destination Think! team and Visit Flanders addressed concerns about ROI by improving word of mouth, supporting a 2017 increase in visitation. 1) Emphasizing user-generated content (UGC) and personal stories. Destination Think! sourced UGC from social media by engaging with the already active community. This allowed us to not only curate historical photos, but it also encouraged community members to share more stories of remembrance, respect and family history within the passionate audience. Visitors also used the channels to talk about trips they had already taken and encourage others to visit. Hundreds of UGC photos were collected by curating some from comment threads on posts within the channel, and actively seeking out others by starting conversations with followers. On key historic dates, we posted photo albums like those above that shared the stories of the soldiers, families and others involved in the war effort. In this way, the Flanders Fields pages became a place to facilitate a conversation within the community, rather than broadcast one-way content. 2) Increasing travel awareness within the channels. We also began to carefully incorporate travel information, while maintaining the integrity of the content. People had joined the page to learn and talk about Flanders Fields and WW1 history, but Visit Flanders wanted to make sure that they are aware of the opportunities to visit current Flanders Fields memorial sites. We used various tactics to educate our audience, taking full advantage of Facebook’s features. The examples below show two Facebook photo albums built to re-purpose the content of a Visit Flanders blog post. We know that Facebook users are more likely to read information published on the platform than click out to a DMO website, so we adapted helpful blog articles into Facebook photo albums. This was an efficient and effective tactic because it addressed some of our audience’s most frequently asked questions about Flanders Fields. We worked in close partnership with the team at Visit Flanders to build travel awareness, using tactics like these that draw on our collective knowledge of the destination and its history. We also applied Visit Flanders’ approach to tourism in the context of heritage and war (Tourism+), which emphasizes the message of peace. “After an in-depth site inspection and plenty of research, Destination Think! quickly found the right tone of voice, and the best way to approach the subject, keeping all aspects of Tourism+ in mind,” says Katrien Timmermans, Marketing Coordinator for U.K., Ireland and The Great War Centenary at Visit Flanders. The two teams worked together to bring the most important stories to the forefront. Visit Flanders is serious about developing its niches. It has hired Product Managers to help improve specific visitor experiences by collaborating with tourism operators and stakeholders. The Product Manager for Flanders Fields is well-versed in WW1 history and the related travel experiences in Flanders. Through Timmermans, our team was able to draw from the Product Manager’s best knowledge, instead of reaching out to individual stakeholders. This allowed us to research efficiently and accurately. With Timmermans as our liaison between agencies and related projects happening in Visit Flanders’ international markets, we provided social media support during key events, such as a Mud Soldier activation in London, and a pop-up mural of remembrance in Melbourne. We were able to collaborate and recommend approaches to Visit Flanders social media content that would support events like these. The Flanders Fields 1914-18 Facebook page grew by 36% (more than 39,000 followers) in 2017. The increase is a result of both organic growth and paid promotion as an element of Visit Flanders’ larger marketing campaign. Our content reached more than 55 million people (measured as unique viewers per month). Meaningful content led to extraordinary levels of engagement. The high levels of growth and reach are a good sign, but more importantly, the community was highly engaged. “Even after 5 years, I’m still impressed by the passion that runs in our community,” says Timmermans. In 2017, over 2.2 million people interacted with the Visit Flanders posts. Some posts gained thousands of shares and hundreds of comments, thanks to the focus on content most meaningful to the audience. As an example, this video was shared by more than 33,000 people and has earned more than 2 million organic views. The quality of comments and the tone of conversation improved. As we posted more UGC photos and stories, we noticed a shift in tone. Comments became more personal, going deeper into family histories. Political arguments about the war became less common as the topics shifted toward stories of individual lives. Word of mouth about Flanders improved as people shared important experiences instead of opinions. This project has helped people connect with their personal histories. 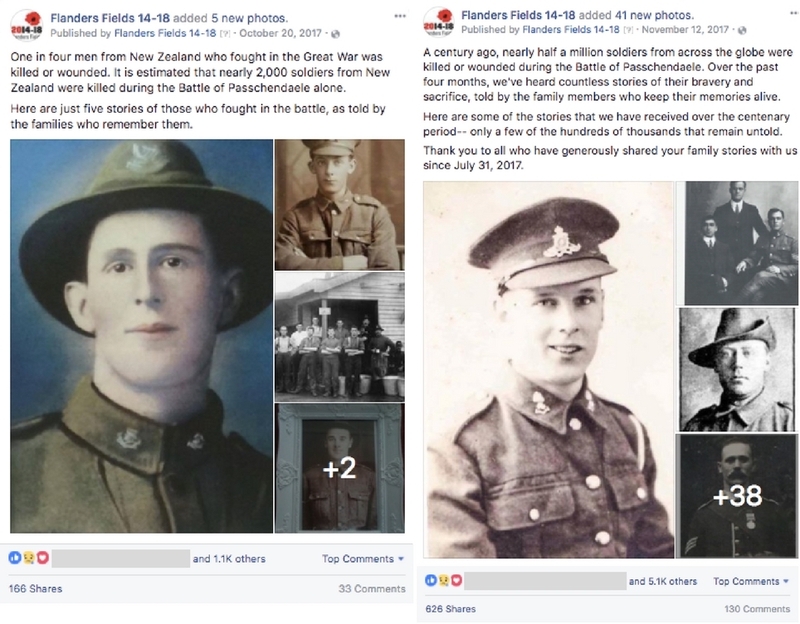 Through the Flanders Fields 1914-18 social media channels, Visit Flanders created space to share individual family histories and honor relatives who served during the war and provided an opportunity for people to discover their own history. For example, some of our conversations helped community members find out where their relative served or was buried. Those people also came away with knowledge and inspiration to learn more by visiting Flanders in person. Visitation to Flanders Fields increased in 2017. Read the full Flanders Fields announcement in English or Dutch. This increase affected international visitors (our primary social media audience) the most. International visitation rose by 7% over 2015 – more than double the overall increase. Visit Flanders won a Travel Marketing Award for Best Use of Social Media in 2017. The content and conversations have been noticed by the destination marketing industry. We’re excited to see that our niche-focused project has helped Visit Flanders gain recognition for its willingness to take risks and make a meaningful impact on the lives of travellers. The Travel Marketing Awards took place in London on March 12, 2018, where the winners were announced. The DMO has built a foundation for the future of travel to Flanders Fields. The opportunity to engage this audience doesn’t end after four years. The centennial years have helped build a foundational social media community, set key dates as landmarks within our content calendar, and better understand visitor needs, but the audience won’t disappear after 2018. The advocates and potential visitors remain active. Visitors will continue to travel to commemorate their loved ones, and Visit Flanders now has a dynamic online space for them to gather to remember, to learn about the war and discover travel opportunities. By improving word of mouth, the Flanders Fields 14-18 project has impacted lives beyond social media. It has inspired people near and far to pay their respects in person and witness history first hand. « Do your visitors still need a visitor centre? These 4 criteria can help you find out.